I panini. Do you panini? Actually I go beyond the average level of panini-ing. I panini in my waffle iron. I do all kinds of things with my waffle iron… AND waffle is a legit verb too. I waffled back and forth on bringing up that gem. I waffle falafel, hot pockets, and more. Make sure to check out the “and more” and you won’t be disappointed. Last night I was in a rush, so I pulled out leftovers from the fridge from recipes made in the last week and I paninied dinner. It was fast, easy, and delish. The ingredients are per panini so double, triple or quadruple as needed. Slice open the pita at the pocket so that you have two sandwich halves. Layer the steamed spinach on the bottom piece. This strategically provides a moisture barrier to keep the bread from turning to mush. Place the grilled chicken slices on top and spread with the alfredo sauce. Layer on more spinach and place the other half of the pita on top. Grill in your waffle iron or make in a pan like grilled cheese. Slice in half and enjoy. You can get creative and use different meats or no meat. You can use zucchini, sundried tomatoes, mushrooms or other veggies if you don’t like spinach. 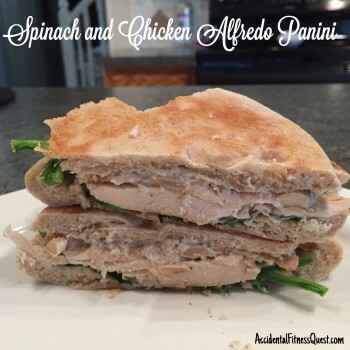 You can even dip your panini in the leftover alfredo sauce. This is one of my favorite sandwiches to make, and it’s so fast and easy with the holidays upon us. So go forth, and panini!